Your outdoor deck takes the bitter cold winter months like a champ, standing against the snow and ice as it falls. It is not uncommon for you to look outside and see your deck buried underneath a pile of snow. The frigid temperatures work to prevent you from going out and removing the snow. So, it just sits there until the warmth of spring begins to melt it away. As that last bit of snow dissolves, your deck reappears showing clear signs of wear and tear from its exposure to the snow, ice and freezing temperatures. With warmer months on the way, your deck desperately needs a face lift. 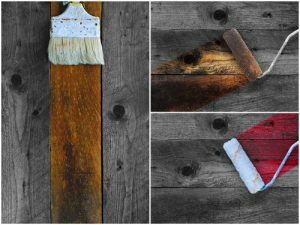 Discover why spring is a great time for staining wood decks. The wear and tear evident on your deck is merely cosmetic. Each time snow melts, moisture seeps through the cracks and other tiny openings in the deck’s surface. This moisture traps itself within the crevices of your deck, never having an opportunity to dry completely out. As a result, mildew and surface stains form on the surface of your deck. Its appearance discolors and looks worn. The longer that winter moisture sits, the greater the chance that your deck will incur damage. Sitting moisture eats away at the wood, making it crack and come up around the edges. You are now looking at costly repairs to fix this issue. Spring presents the perfect opportunity to prevent extensive damage before it has a chance to start. Staining your deck will remove any moisture and discoloration that is taking place, replacing it with a layer of protection over the surface of your deck. Your deck now look as good as new. Summer is right around the corner, and with it comes warmer temperatures and sunshine. Your deck will have little to no protection from these harsh elements. The ultraviolet (UV) radiation that the sun produces can be deadly for your outdoor deck. UV rays beat down on the deck surface, making it heat up. Additional damage forms as the UV rays weaken the fibers inside the wood boards of your deck. As the boards weaken, surface erosion takes place, which leads to a shorter life for your deck. Spring is the perfect time to ward off this potential damage by staining your deck. The stain serves as a protective barrier between your deck and the outside elements. The summer sun will still beat down on your deck, only now it won’t be able to penetrate the surface. Staining your deck in spring will add to the life of your deck, ensuring backyard fun for many years more. It’s difficult to know what shape your deck is in during the winter. Most of the time, the sheer amount of snow coverage makes it impossible to tell where your deck ends and your backyard begins. With all of this going on, you are most likely unable to conduct a close-up, visual inspection of your deck. You have virtually no idea what kind of shape it is in or if there is any damage that you need to address. Spring gives you the perfect opportunity to conduct a maintenance inspection as you prepare to stain your deck. 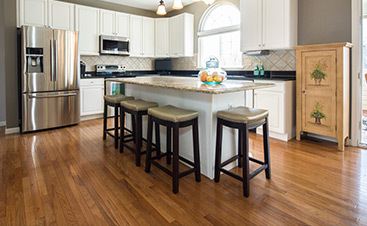 Look for signs of rotting wood made noticeable by a darkened color that is different than other areas of the wood. Remove any debris, such as leaves or sticks, which has fallen into the spacing between each wood slate. Clean the deck surface with a mixtures of warm water and laundry detergent, and scrub the surface with a stiff brush. You can use a pressure washer for cleaning the surface before staining it as well. 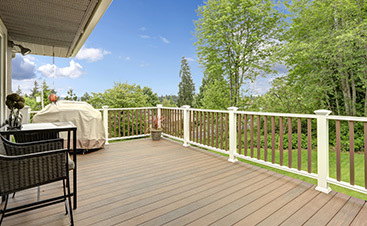 Stain serves as a protective coating for your deck. It seals in whatever resides in every nook and cranny of your deck’s surface. When you decide to stain your deck without performing an inspection first, you could unknowingly be trapping pools of moisture, cracks or surface erosion problems. Each of these issues can bring about a premature ending to the life of your deck. Undetectable problems lurking in your deck can render your staining efforts useless. A visual inspection is necessary prior to staining. 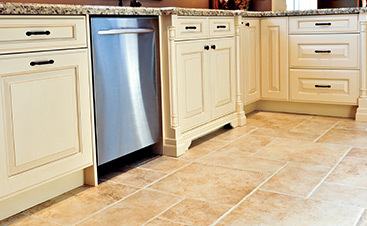 This inspection will allow you to be confident that you have correctly taken care of any damages present. Staining your outdoor deck is a fantastic way to restore its natural beauty, making it the shining star of your backyard. Other times of the year come with weather that does not cooperate like spring does, making any efforts to stain your deck unsuccessful. In spring, everything is coming alive after being hidden for much of the winter months. Spring is a perfect time to contact your local flooring and deck professional to prepare your deck for the upcoming outdoor activities with family and friends.